All transactions are safe and secure with a reliable history in online purchasing behind each of our associates. Buy the Greenman Costume to own It's Always Sunny in Philadelphia clothing and merchandise. 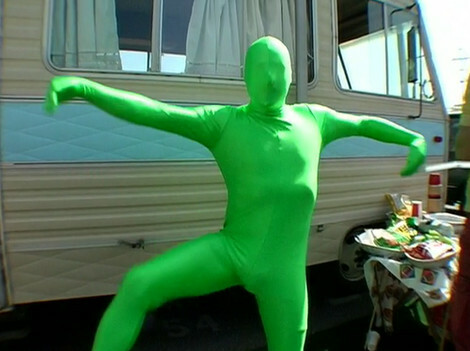 The Always Sunny Greenman costume has become a cult sensation among fans of the hit TV show. The creator and star of the FX TV series, Rob McElhenney, talked about the origins of the Greenman suit during a college speaking appearance. He explained that a friend of his regularly wore the costume to an Eagles football game, calling himself The Greenman. Fans around the world have been spotted wearing the costume. Purchase it with a Paddy's Pub shirt. In addition to the Greenman Costume above, browse the It's Always Sunny in Philadelphia Clothing Gallery for more apparel like men's and women's clothes, kids shirts or hoodies.